Today, Japan is by all metrics a first world country: It is an advanced democracy with the world’s fourth largest economy, its citizens enjoy the world’s highest life expectancy, and it leads the world in industries such as steel, automobiles, and consumer electronics. However, barely more than 150 years ago, Japan was an isolated feudal society with little contact with the outside world and few raw resources to trade. Yet, after the country was forced to open its borders by Americans under the command of Commodore Matthew Perry in 1854, it took less than 40 years for the country to modernize to a level comparable to the most advanced European states at the time. By 1894, Japan was officially recognized by Western powers as an equal with the revision of various ‘unequal treaties’. Just one decade later, Japan’s stunning victory in the Russo-Japanese war further cemented Japan’s economic and military prowess. Tokyo, Japan’s capital city, is a shining example of modernity. This leads to the question: Why was Japan able to modernize so quickly, while other countries even today struggle to develop their economy? By examining Japan’s history during the 19thcentury and comparing its modernization efforts to other states around the world, it becomes clear that Japan was able to modernize with little problem because of its geography and its homogenous population. However, this does not mean that modernization is impossible for countries without such favourable factors, as the most critical factors of success include a general willingness from every stratum of society to accept change and move forward, as well as a government’s implementation of the right social and economic policies. Although initially reluctant to deal with foreign powers, the shogunate – the military leadership with de facto rule over Japan – quickly realized that a head-on conflict was not a viable option, as Japanese military might was no match against the West. As such, they agreed to a series of treaties with Western powers in order to appease them, opening up trade and establishing foreign consulates. In addition, the shogunate quickly sent naval students to study abroad, and invested in the modernization of the military with the help of France. However, the daimyos (feudal lords) of two regions, Satsuma and Choshu, sensed that the shogunate was too weak to effectively deal with the foreign threat. Instead, they believed that the best course of action was to unite all of Japan and centralize power under the emperor Meiji, who at that time was only a symbolic leader with no actual political power. Realizing his fate, the shogun decided to step down and abolish the shogunate, but later changed his mind. This lead to the outbreak of the Boshin war between pro-imperial and pro-shogunate domains. However, with a better-modernized army and extensive British support, the pro-imperial camp was able to quickly defeat the remains of the shogunate, leading to the completion of the Meiji restoration. Samurai during the Boshin War. Largely owing their success to their modern military and realizing the need to expand the economy in order to maintain it, the new imperial government immediately began work on extensive reform. First, feudal domains, as well as the samurai class, which was now a vestige of the previous regime, were completely abolished. Despite this, many samurai were able to join the military or the government with their previous experience. Next, the government worked to industrialize the country. Infrastructure, such as railroads, ports, and telegraph lines were built all over the country. At the same time, the government focused on developing the textile and steel industries, as well as the creation of massive conglomerates known as zaibatsu. This caused the beginning of a cycle, as the new infrastructure allowed for more people and goods to travel around the country, which in turn enabled companies to expand their market, increasing their production to meet growing demand. As a result, businesses increased their profit, which also increased the government’s tax revenue, enabling them to build even more infrastructure. Finally, the new regime took drastic steps to reform government structure, which heavily resembled on the Prussian model. An independent judiciary, complete with a new criminal and civil code, was established in 1875, while a constitution was carefully drafted and implemented over the span of five years from 1884 to 1889. With the constitution came the creation of two legislatures, the House of Representatives and the House of Peers, as well as basic rights given to all Japanese citizens. By the death of Emperor Meiji in 1912, Japan was fully industrialized, and by defeating Russia and China in separate wars, it was even able to expand its territory to include Korea and Taiwan. One of the main factors that allowed Japan to modernize so quickly is its geography. As an island nation, Japan is isolated, meaning that it did not need to worry about invasions from neighbours such as China or Korea. This sense of safety meant that Japan was able to avoid war and destruction throughout the centuries during which it was isolationist, and instead focus on economic and social matters. 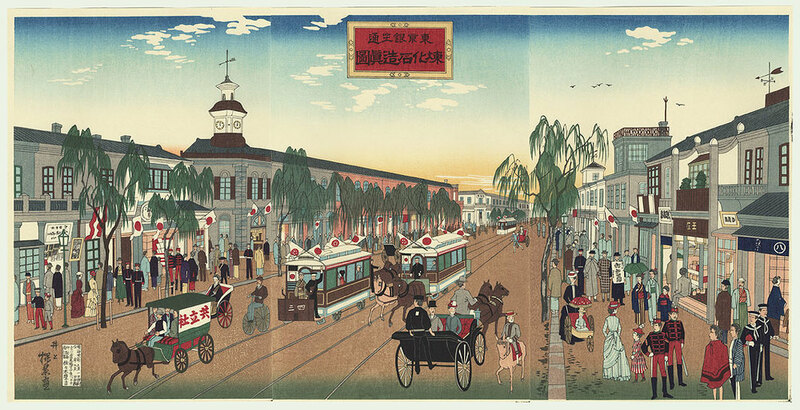 Throughout the Edo Period (1603-1686) preceding the Meiji Restoration, domestic trade flourished. Moreover, due to the lack of wars, the samurai class began to work as bureaucrats. As a result of both factors, education became highly valued in Japanese society, and basic schooling became available even for commoners under the Tokugawa Shogunate. By the end of the Edo Period, around 40% of Japan’s population was literate, which was comparable to that of Italy in the same time period. In 2017, 98.5% of people living in Japan were ethnically Japanese. In addition, Japan’s homogeneity played a huge role in its quick modernization process. Other than a tiny population of Ainu and Ryukyuans, the entire population spoke the same language and adopted the same culture. Thus, ethnic and religious conflicts among the Japanese were virtually non-existent, which allowed the government to more effectively govern the nation. More importantly, however, it should be noted that during the process of modernization, there was a strong general will to embrace change within all echelons of society. Part of this acceptance can be attributed to the government victory in the Satsuma Rebellion, which cemented the end of the samurai class and any hope of returning to a feudal Japan. Meanwhile, the merchant class benefitted greatly from the government’s investment in infrastructure, which made it easier to transport goods and allowed previously inaccessible resources to be exploited. Moreover, because the Western powers forced Japan to set their tariff rate at 5%, factory owners could cheaply import raw resources and the latest industrial machinery from Europe, which allowed factories to maximize their production, cementing Japan’s new status as a manufacturing hub in East Asia. Finally, commoners benefited from the government’s implementation of universal education, which, combined with Emperor Meiji’s Charter Oath, made it possible for any Japanese citizen to rise through the ranks and achieve economic prosperity. Compared to many developing countries today, Japan focused heavily on education and industrialization. By making sure that its entire population was educated, it ensured that people were able to obtain the skills necessary to participate in a modern workforce. This, in turn, allowed businesses to operate efficiently and profitably. At the same time, the large pool of students generated by compulsory education resulted in many of Japan’s brightest minds being able to travel overseas to Europe and North America. When they returned, they brought back with them new ideas, boosting innovation within the home country. As well, the government painstakingly built model factories and controlled many aspects the economy at the beginning of its industrialization, which gave Japanese businessmen an example to build off of while simultaneously streamlining the entire process. Later, when these model factories became increasingly expensive to operate, the government sold them off to private investors and simplified business laws, which encouraged further investment and economic growth. With consistent growth, unemployment never became an issue as employers remained confident in their company’s continued profitability. This lead to more jobs being created, higher wages, and a general increase in productivity, which resulted in the formation of a strong middle class and solidified Japan’s status as a developed nation. Although Japan’s geography and cultural homogeneity made it much easier for the country to modernize, the people’s willingness to change, as well as the economic and social policies of the Meiji government were decisive for its enduring success. By investing heavily in education, encouraging competition, and developing infrastructure, Japan was able to completely transform itself within the span of a few decades from a feudal society to a modern industrial power boasting military power comparable to the leading world powers of the era. While certain factors are unique to Japan, other countries can still look to this island nation for inspiration when it comes to questions regarding their path to modernization. However, this article does not assume that modernization is the necessary missing ingredient for the prosperity of today’s underdeveloped nations. There are many different pathways that lead towards a country’s wealth and success. Nevertheless, it is noteworthy to illustrate the key factors that lead to Japan’s modernization, as it lends insight into Japan’s unique history and also demonstrates potential strategies for other countries to consider adopting in their path to economic and social development.